Central Publicity Affairs Secretary of Bangladesh Jamaat-e-Islami, Professor Md. 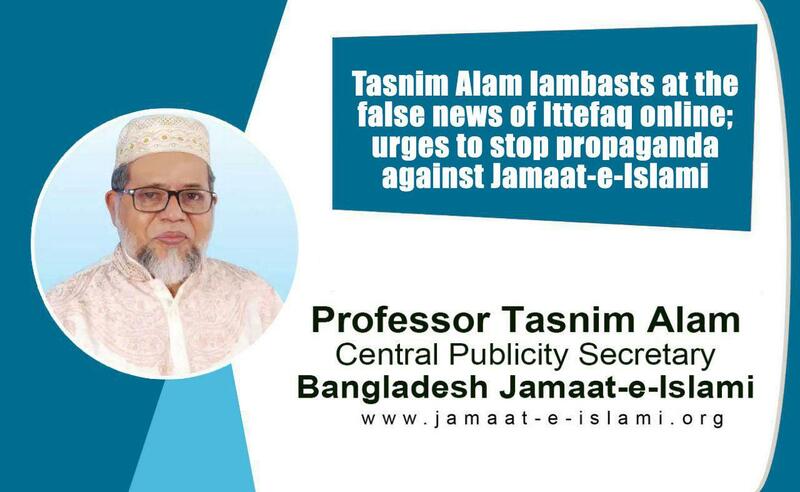 Tasnim Alam has issued the following statement on 7 March 2019 protesting and gainsaying a false report published in the online version of Daily Ittefaq on last 6th March which quoted a so-called proposal of US House of Representative Jim Banks. “We have observed a baseless and false news published in the online version of Daily Ittefaq on last 6th March referring a so-called proposal which had been tabled by US House Representative on last 28 February. Bangladesh Jamaat-e-Islami is not informed whether this proposal of Jim Banks had been passed or not. If it so, we are vehemently condemning it. We are surprised over the published news. Whatever is said in the aforesaid report of Daily Ittefaq about Jamaat-e-Islami, is not true. We want to affirm that, Jamaat-e-Islami has no nexus with war crimes or crimes against humanity. There is no scope for Jamaat-e-Islami to indulge the regional terrorism of South Asia. As such, Jamaat can never be a threat to regional freedom and stability. I am urging US House Representative Mr. Jim Banks and all the concerned quarters to be refrained from making false and baseless propaganda against Jamaat-e-Islami.